COLUMBIA, SOUTH CAROLINA – Callison Tighe member Reece Williams long has been a passionate supporter of the University of South Carolina libraries, so he’s well acquainted with the treasures within their walls. Yet occasionally even Williams is surprised. 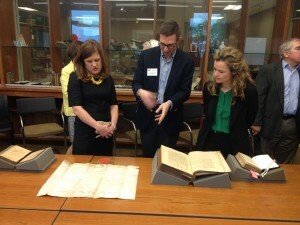 His discovery a few months ago, during an exhibit titled “Our First Century: Early Printed Books at the University of South Carolina, 1471-1571,” was one such instance. As he looked over the books on display, he spotted a copy of “De Legibus et Consuetudinibus Anglicae” by Henry de Bracton that was printed in 1569. That makes it a rare first edition of a book that became the framework for British jurisprudence until well into the 1800s. As an attorney, Williams did. Williams quickly marshalled some forces. He made calls to the University of South Carolina School of Law and gathered a group to meet for a special showing of the book. The volume at the Irving Department of Rare Books and Special Collections at the Ernest P. Hollings Special Collections Library is written in Latin. Williams said the calfskin-bound book is in good enough condition that a group he gathered was allowed to touch it. No one is sure how the book made its way to Hollings library. According to an article by the South Carolina Bar, the edition bears a marking from the pre-Civil War South Carolina College, USC’s predecessor. That indicates the book has been in Columbia for at least 180 years. There are margin notes and underlinings made by an earlier owner, an attorney working perhaps in the 15th or 16th century. Neither is anyone sure how many first editions exist, though there are a few scattered in law libraries across the United States, England, Australia and New Zealand. What Williams is sure of is that the special book won’t remain hidden any longer. He and the library are working on plans for a major event, possibly in the fall and tied to the anniversary of the Magna Carta. Tentative plans include a lecture, a program that could draw hundreds of people and a reception. The School of Law is interested in planning something, too. PICTURED ABOVE: Attorney Carmen Thomas, University of South Carolina rare books librarian Jeffry Makala and attorney Lucile Cohen examine a rare Henry de Bracton first edition recently discovered at the USC library.